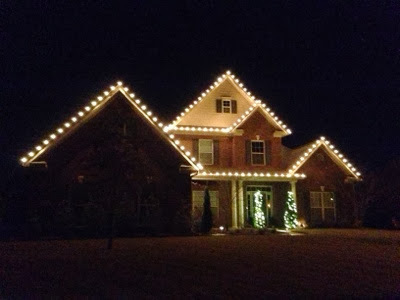 I was going to try to fly below the radar with the fact that we have decorated for Christmas, but now that our exterior white lights have been put up and you can see the outline of our house from Old Big Cove Rd...inconspicuous we are not. It should really not come as any kind of surprise to those that know us that our trees are up and decorated and our lights are on the house. We love the Christmas season so much we can't get enough of it in just one month so we let it bleed over through November as well. I was really nervous putting our trees up this year, with a very mobile 10 month old scurrying around them. 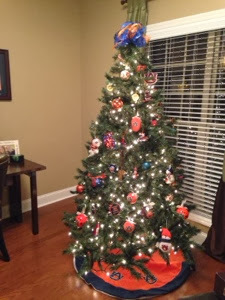 Our fragile ornaments have migrated towards the top of the tree for sure, but we figured we would put them up and just see what happens. For the most part Perry has ignored the trees and the wrapped presents underneath. 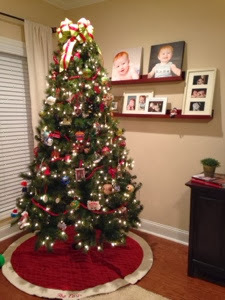 We do have some stuffed ornaments hanging near the bottom that he has taken off and played with once or twice, and we have had to divert him away a couple of times...but no disasters yet. We bought Perry a wooden nativity scene for Christmas last year and unwrapped it on his behalf about a week before he was born. 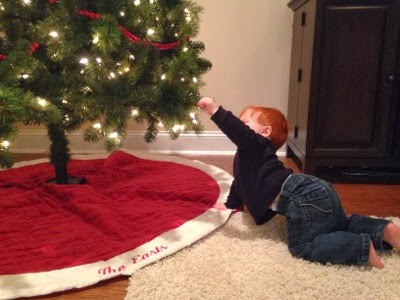 We could not wait to pull it out this year and let him actually play with it. 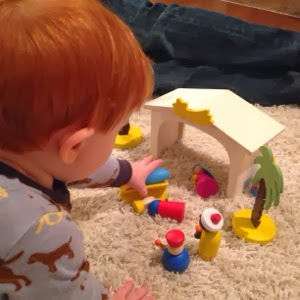 He has had a great time picking the figures up, chewing on them, and banging them on the floor/coffee table...thats how a 10 month old plays with a nativity. He is particularly fond of the baby Jesus which makes this mommy's heart happy. We are so looking forward to many Christmases to come when we can really teach him about the nativity and real reason we are celebrating.